The 64th Annual Florida Beef Cattle Short Course provides an excellent opportunity to display your company’s literature and products by becoming an Exhibitor. This year, the Beef Cattle Short Course Trade Show will be held in conjunction with the Thursday afternoon program at the Horse Teaching Unit. 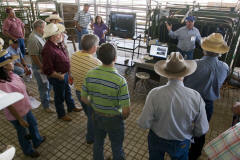 This change to the Beef Cattle Short Course program provides a new and extended opportunity for Exhibitors and Participants to interact. The Trade Show will begin Thursday at noon and run throughout the afternoon and evening activities. We hope this change in venue and time increases the opportunities for our Exhibitors and Participants alike. This will include registration for one person at the Florida Beef Cattle Short Course, contact information listed in the proceedings, and one 8' draped & skirted table. 2015 Exhibitors will have a unique opportunity for 7 hour exchange with our participants due to the new venue on Thursday afternoon at the Horse Teaching Unit. Only a limited number of opportunities are available. Exhibitor Registration for this event has closed. Special Needs: Special needs (such as visual, hearing or walking impairments) of registered attendees can be reasonably accommodated by contacting Rebecca Matta at the University of Florida, Department of Animal Sciences. She can be reached by phone at 352-392-1916, by fax at 352-392-9059, by email to rmatta@ufl.edu. If calling from within the State of Florida, the office can be reached through a telecommunications device for the deaf (TDD) at 1-800-955-8771. All exhibitor funds are received through the University of Florida Leadership And Education Foundation, Inc. on behalf of the short course.